Harbor’s End tattoo artist Matt Vaught embellishes an existing tattoo on his assistant.Photos by Charlie Craig. While the locals on Oak Street are readying for their ritual transformation into a trick-or-treating block party on Oct. 31, Mason El Hage, owner of Harbor’s End Tattoo, is planning his Haunted Harbor’s End Halloween Bash with neighbors, Red Matter Gallery, Mozambique and the Sandpiper Lounge. It is a long-standing tradition of many tattoo artists to offer Halloween tattoos for $31 and Friday the 13th tattoos for $13 as way to get patrons into their shops, and Harbor’s End is embracing the practice. El Hage is working on new “flash,” small pre-drawn designs, that customers can select at the Bash, 6-9 p.m. Saturday, Oct. 29, 1850 S. Coast Highway. The weeklong celebration, which will include a costume contest and tattoo giveaways culminates at Thursday’s Nov. 3 Art Walk where Harbor’s End tattoo artist Arturo Guevera will display his acrylic pieces at Red Matter Gallery next door. Anthony Ianozzi, a Laguna College of Art & Design student and tattoo artist at Cast of Crowns Art Collective, is also offering a Halloween tattoo special. Patrons can have palm-sized Halloween or villain portraits inked for $400 to $600. The gallery portion of the shop at 412 N. Coast Highway will also have live music and LCAD student work on display during the Nov. 3 Art Walk. In 1960, there were 500 professional tattoo artists plying their craft in the U.S. By 1995, that number had risen to over 10,000. Demand continues to surge, and by the latest estimates, 20 percent of Americans have a tattoo, Atlantic magazine reported in November 2014. In antiquity, tattooing was anything but art. “Otzi,” mummified more than 5,300 years ago and discovered in 1991 on the Italian-Austrian border, sported 61 tattoos, which scientists think were used as a treatment for pain, somewhat like acupuncture, National Geographic reported. Greek writer Herodotus, c. 450 B.C., noted that for the Thracians of Southeastern Europe, tattoos were greatly admired and “tattooing among them marked noble birth, and the want of it low birth,” according to Archaeological Institute of America. Tattoo artist Devan Mena adds to Morgan Vanderwall’s three trees at Laguna Tattoo. Tattoos common in the Greek and Roman eras were called “stigma” and were used to signify membership in a religious sect or in the case of slaves, ownership. Roman soldiers were tattooed until the emergence of Christianity when tattoos were felt to “disfigure that made in God’s image,” according to the Smithsonian Magazine. When Laguna Tattoo opened its doors at 656 S. Coast Highway in May 1982 there were only three other tattoo shops in Orange County, their website says. Devan Mena, who has worked in the shop for seven years, says it’s now the oldest operating tattoo studio in the county. He and longtime colleague Marcus Arroyo are unsure about offering Halloween specials. Like Harbor’s End, Laguna Tattoo charges an hourly rate of $150 with an $80 minimum. They operate under a license from the Orange County Health Department, as does Cast of Crowns, and are subject to random inspections. Each artist must renew their individual license yearly, passing on-line courses in blood born pathology. El Hage, Arroyo and Guevera all say they’ve been drawing since childhood. El Hage won his first drawing award when he was 6, received recognition for his ability in high school and was accepted to LCAD. While the art of tattoo was alluring, his Lebanese father discouraged him because it conflicted with their religious beliefs. In addition to a proficiency in drawing, tattoo artists typically serve an un-paid apprenticeship with a master. Arroyo’s mentor in Jacksonville, Fla., agreed to share his talents because his protégé already had a fulltime job, which he felt demonstrated stability. Harbor’s End tattoo artist Arturo Guevera, a son and grandson of artists, remembers a source of artistic inspiration in the 1999 visit of his father’s friend, Mexican muralist Raul Anguiano, who painted “The Mayas: Magic, Science and the History of the Maya,” in the Bowers Museum of Santa Ana. “I have produced art in all media from spray can to acrylic, which is my chosen medium next to tattooing, which I have been practicing for over 15 years,” Guevera added. Many artists develop a following and customers who return for more ink. 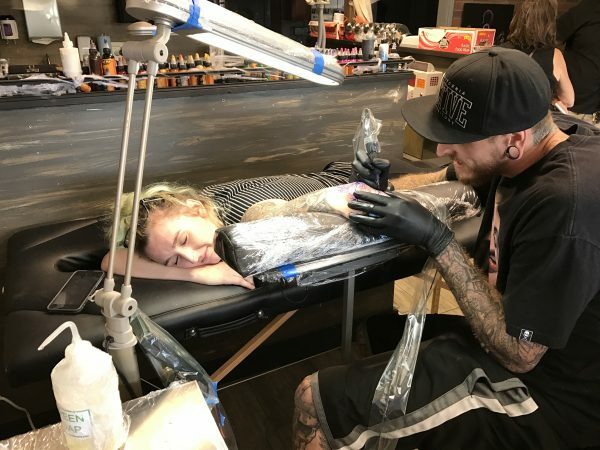 At Laguna Tattoo, Mena recently embellished an existing tattoo of three evergreen trees on the arm of Morgan Vanderwall, 21, done by another artist in her hometown of Seattle last year. The trees represent home and her two siblings. 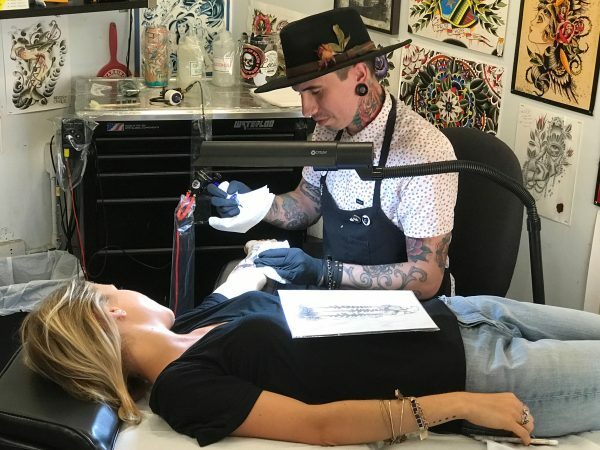 She knew the evergreen tattoos would be just the beginning, said Vanderwall, now a West Hollywood resident, who has added tattoos of maps symbolizing her volunteer work in Africa, the forest floor where her grandmother’s ashes were recently spread and a night sky. After searching from San Pedro to San Clemente for the right place to open shop, El Hage feels satisfaction at returning to the town where he hung out as a kid and to the profession he loves. “Tattooing is an intimate process. It’s a little like therapy, when a customer is on the table for four hours, you get to talking,” he said.